Let us bring your baby back to glory! B&G Auto Body has a team of vehicle paint experts ready to put the WOW back in your vehicle’s finish. We use only the best Low VOC Waterborne Paints from Valspar to give your car or truck an unbeatable finish. Whether you are looking to preserve a classic or add value to a vehicle you are looking to sell, choose the auto paint team at B&G Auto Body to deliver a paint job you can be proud of at a price that is fair. You can’t cut corners on the road to quality. Sure there are auto paint centers in Delaware that will tape up your car and spray a coat of paint over dirt, dents and rust. Those big name centers will happily provide that service at a bottom dollar price, too. At B&G Auto Body, we do auto paint the way that it was meant to be done. We’re not simply taping off your car and spraying away; we will remove all exterior trim and commit to only painting a clean and prepped surface. 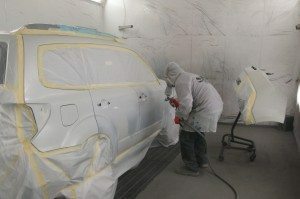 We spray a base coat and a clear coat to ensure that the finished product is ready to get noticed driving down the road. Furthermore, our paint job is guaranteed against cracking, peeling as long as you own your vehicle. Call or stop by today to learn more about the best auto paint job money can buy in the New Castle County, Delaware.